Day 4 of September sneak peeks! We're so glad you came back for the last day of September sneak peeks! Our first two sets are a continuation of our Flower of the Month series. Next month, will be the last two of the series so you can start making Christmas presents! Our other Designers that are featuring samples on their blogs for Chrysanthemum - November Flower of the Month are: Katie, Sarah, Stacy, Candy and Laurie (links on left sidebar). I think this poinsettia will make some gorgeous Chirstmas cards, gifts, and ornaments! Our other Designers that are featuring samples on their blogs for Poinsettia - December Flower of the Month are: Angela, Trudy, Katie, Linda A., Stacy, Candy and Laurie (links on left sidebar). September's stamp of the month is FREE with a $50 order! Candy combined the Stamp of the month with our new set I A-door you....isn't this so cute? Our other Designers that are featuring samples on their blogs for What A Pane September 2009 SOM are: Angela, Trudy, Katie, Sarah, Cassie, Candy and Laurie (links on left sidebar). Who doesn't need leaves? Perfect for all your fall pages and projects! Our other Designers that are featuring samples on their blogs for Leaf Trio are: Katie, Tricia, Sarah, Candy and Laurie (links on left sidebar). Tomorrow is the big day! Make sure to come visit us! Day three is for all you and your classic car enthusiasts ! We have picked several different classic cars and trucks that we are sure will be a hit! Do you go to Cruise Ins? Why not make up a few cards and try to sell them while you are there? I just know that they would go crazy for them! Candy chose to make a little mini accordian scrapbook.....I just love it! Our other Designers that are featuring samples on their blogs for Cool Ride are: Angela, Trudy, Katie, Linda A., Tricia, Sarah, Cassie, Stacy, Candy, and Laurie (links on left sidebar). Our other Designers that are featuring samples on their blogs for Gas Can are: Tricia, Sarah, Cassie and Candy (links on left sidebar). Our other Designers that are featuring samples on their blogs for Ford Coupe 1939 are: Trudy, Sarah, Stacy, Candy and Laurie (links on left sidebar). Our other Designers that are featuring samples on their blogs for Corvette 1968 are: Tricia, Cassie, Candy and Laurie (links on left sidebar). Our other Designers that are featuring samples on their blogs for Chevrolet 1957 are: Tricia, Cassie, Candy and Laurie (links on left sidebar). Our other Designers that are featuring samples on their blogs for Chevy Truck 1956 are: Angela, Katie, Linda A. and Candy (links on left sidebar). Our other Designers that are featuring samples on their blogs for Camaro 1969 are: Trudy, Sarah, Stacy and Candy (links on left sidebar). Our other Designers that are featuring samples on their blogs for Mustang 1965 are: Angela, Katie, Linda A. and Candy (links on left sidebar). Day 2 of September sneak peeks! Welcome back for day two of sneak peeks! Let's get started! Charlie is so thankful for all the blessings that have come his way, and all the new stamping friends that he has made during our past year with him! Wouldn't he make adorable Thanksgiving place cards? Our other Designers that are featuring samples on their blogs for Charlie Harvest are: Angela, Trudy, Tricia, Stacy, Cassie, and Laurie (links on left sidebar). I think this little girl is just adorable! Birthday or Friendship cards are a snap with this set! Our other Designers that are featuring samples on their blogs for Get Off Your Tuffet are: Angela, Linda A., Sarah, Cassie, and Candy (links on left sidebar). Now this is certainly a stamp set for cards AND scrapbook pages! What about decorating a lamp shade or a room border with this set? What about a picture frame with your favorite little racer in it? Party favors? The options are endless! Our other Designers that are featuring samples on their blogs for At The Races are: Kim, Katie, Sarah, Stacy and Candy (links on left sidebar). The samples for this set are just tea-rrific! You'll just have to visit all the blogs to see what our designers have been up to! Our other Designers that are featuring samples on their blogs for Tea-rrific are: Angela, Trudy, Katie, Linda A., Tricia, Cassie, Stacy, Candy, and Laurie (links on left sidebar). Let the September sneak peeks begin! Day one of Sneak peeks is here! The kids are all back in school, and now it is time to let the stamping begin! We have some really wonderful sets for you to dive into your fall stamping with this month! Our first set is I A-door You. Perfect for all year around, for baked goods tags, birthdays, pick me up cards, and so much more! This is Candy's sample with this set, but I can only show you part of it until Monday, as the Stamp of the Month is used for the sample too.....so here is a little snippet! Our other Designers that are featuring samples on their blogs for I A-door You are: Angela, Trudy, Katie, Tricia, Cassie, Stacy, Candy and Laurie (links on left sidebar). Our Canadian customers have been asking for this set for quite some time! Our very own Canadian, Kim Teasdale, has come through for you! Hockey Time is perfect for cards and scrapbook pages. Candy thought outside of the box and came up with a dorm room or locker project! The white space is one of our dry erase sheets! How cute is that???? And a little cork star. I love this project! Our other Designers that are featuring samples on their blogs for Hockey Time are: Kim, Angela, Linda A., Sarah, Stacy and Candy (links on left sidebar). We have a new series of stamps starting! I am calling them Value Verses and they will be sold at 20% off of retail! Every month, we will introduce at least one value verse for you to add to your collection to spread the gospel! Our other Designers that are featuring samples on their blogs for Romans 8 38-39 are: Angela, Linda A., Cassie, Stacy and Candy (links on left sidebar). Fall is the perfect time to start thinking about cozy coffee breaks with friends! The samples for this set are just adorable....make sure to visit all the blogs to see what you can create with this set! Our other Designers that are featuring samples on their blogs for The Grind are: Angela, Trudy, Katie, Tricia, Sarah, Cassie, Candy, and Laurie (links on left sidebar). See you tomorrow to continue on our sneak peek journey! A Masked Kiss Part 2 of 2 - Happily ever after! Hi Friends! Its Katie here to welcome you to another fabulous Tuesday. As my title states, today's post is number 2 of 2. I covered the masked kiss part last Friday (just scroll down if you missed it) and today's post is really a way to house and decorate all your hard work from last week. So this is usually the way it works for me. When I make cards as a gift, I generally like to make them all the same and when I'm done I try to think of a nice way to decorate the box/carrier/bag etc so it will be a complete look. For this set of cards I decided to go about it a little differently. I decided what type of box to house them in and then made a card front (not the entire card) to place right smack on the top of my box. I then took that card front and that design became the design and layout of all the cards inside the box. I'm sure you all might be saying "well duh", but for me it was a light bulb moment. I have to be honest and say that I don't get that many and when I do I enjoy them (hehe). So as you might of guessed, the card front is the design from last week and today I'd like to show you how I created the box for them. This box is big enough for the envelopes to be held in the box, but if you wanted to house more cards in the box there is no reason that the envelopes can't be bundled with a nice ribbon and given along with your cards. So let's start. You will need a piece of cardstock measuring 11" x 7 3/4" for your main box. Score along (parallel) the 7 3/4" side at: 4 1/2", 5 1/2", and 10"
Turn your cardstock, along (parallel) the 11" side score at 1" on both the left and right side. Next cut where all the red dotted lines are located. It will now look like the (below). The sides that were cut off will be the top of the box. Flip your box over and place adhesive on all the tabs marked with "A". Flip over again and place all your tabs on the inside; set aside. Cut 2 pieces of cardstock measuring 6 1/2" x 5". These are going to be your top and bottom pieces. Use a corner rounder to clip all corners. Attach the card front to one of the 2 cut pieces of cardstock. This is going to be your "decorative" element to your box lid. Cut 2 sections of ribbon approximate 12" long. This will give you more than ample length to tie a generous bow when its secured. Adhere the ribbon to the bottom and lid of your box approximately 1/2 way across. Place scor-tape or equivalent double sided tape to the edges of your box lid and bottom. In order to make things easier, before I took the tape covers off I placed the box down onto my decorative pieces and adjusted it so it was nice and even. When I got it exactly like I wanted then I took a pencil and lightly marked the placement ( just one corner or 90 degree angle). This made it a lot easier to place my box down without a lot of unevenness and frustration occurring once the tape was ready to go. The box lid was a bit easier to attach because there was a lot more room for fingers and easier to judge distance too. Another great little tool I use is my Cricut spatula, but all you need is anything like this tool that has a smooth flat surface. I use this to make sure that all my pieces of cardstock are adhered. This works even better for the inside bottom of the box. Now for the card dimensions. As I said earlier, when I give gifts of cards I do like to mass produce. In this case it was only 5 cards, but its still so much easier to cut all the pieces out and then assemble your cards. The only thing that isn't shown is the blue mat around the punched ovals. I did cut those by hand, but if you had coordinating punches then that would obviously be a bit faster but not my much! So here is the card box finished and closed. Well that's it folks. I hope you enjoyed today's tutorial and I sure hope you have a fabulous week! Thanks as always for stopping by Clearly iStamp and spending some time with us. If you missed the new store front celebration, don't worry. There is still plenty of time to hop on around and get lots of inspiration. There are also lots of specials going on at the store so make sure you don't miss out. 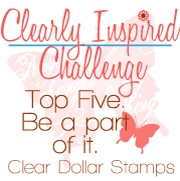 CLICK HERE to visit Clear Dollar Stamps store front. Plus CLICK HERE to read about all the details on how you could still win a super GRAND PRIZE... I'm going to be a tease and tell you its just HUGE! Go see for yourself and get the directions to what you need to do to be eligible. You've got until the end of the month!!! Scroll on down to get the ingredients list and once again, thank YOU! Hi, its Katie here again to bring you some more stamping fun. What do you think of my title?? Just having some fun :) Today I wanted to feature a new stamp that debuted on the same day of the new online store front. If you didn't know, Lori introduced quite a few new Dollar Stamps (scroll down just a tad). Just a note here for clarification - Dollar Stamps usually range from $1.00 - $3.00. The stamp I'm featuring today is called Rubber Boots and is just plain cute and very versatile. I'm going to use the outline stamp of the boot to show you a technique called masking, which is the creation of a "mask" to cover your stamped image so that you can stamp over your original image. Take a look below. First, you will want to stamp your image on a post it note. Make sure to stamp part of the image on the sticky part of the note. In the case of the boot, I placed the boot which is the most solid part of the image on the sticky part. Cut out your image. This is a great image to cut out, not a lot of tiny spots! I didn't cut out the little details on the rubber handles for the boots and I think the image turned out great. *Cutting tip - move your paper, not your scissors. Next, stamp your image onto your cardstock (or wait - always do a first run) then lay your "mask" over your stamped image. Then stamp you image next to and over the masked image. You'll see why my picture is labeled "wrong". Now for the correct way. And you can just keep on going and going and going. Hey, this is what it looks like with my twins! So that's it for masking, but before I get to the naughty stuff, I wanted to share how the other boot looks in the set. On the top half, I stamped the individual pieces and on the bottom I stamped what the image will look like all put together. Ok, now for the kiss... this kind of kissing is the most innocent type there is. Its a matching of a background type of stamp married to another image stamp to get a very sweet result. I grabbed an old favorite... Too Sweet (special discount applies until the end of the month) to help me out. Stamp your image and make sure that your other stamp is ready to go on its block. Stamp you inked image right onto your background stamp. Press and lift. Then stamp onto your cardstock and add the other images to finish it off. Now... I did say that this is post one of 2 posts so I'll show you the card front that is an integral part of Tuesday's post. I have very specific dimensions to the card and I'll share that with you on Tuesday too along with rest... but in the meantime, isn't this rubber boot just precious? Sentiment is from this cute set called Charliene April Showers. I won't be using an additional stamps for the follow up post so feel free to add this little guy to your shopping cart *wink*. Oh, and one final note. If you haven't been over to the Clear Dollar Stamps new store front, you better head on over. You are definitely missing some sweet eye candy and some yummy specials. And, the GRAND PRIZE for the Grand Re-Opening is still open until August 31st. CLICK HERE to read all the details. Thanks as always for coming to visit us here at Clearly iStamp and I hope you have a fabulous weekend ahead! Good morning friends. I know I keep saying this, but I just want to say it one more time. We had such a great time with the new store front and the blog hop and everyone here at Clear Dollar Stamps would like to say a big thank you and hope that you had as much fun! I have to be honest and say that altering is just something I don't do very often. I love the idea of it, but I can never seem to find the right thing to fit into the right container - know what I mean? That is until now. I'm sharing a project with you that I did for a friend of mine as a little thank you. I wanted to make cookies and as I was trying to figure out what type of cookies to make I glanced at an empty coffee jar that I had. I had set it aside a while back, but like I said I had no idea what to use it for. I decided to make Snickerdoodles because I figured they would ship well. The recipe I used is a Betty Crocker recipe, and I have to say this was the second recipe I made... the first one I did not like so I won't even go into that. Heat oven to 400 degrees. Combine flour, cream of tartar, soda, and salt. Whisk together and set aside. Mix shortening, butter, 1 1/2 cups sugar until blended (1 -2 minutes). Add eggs and mix thoroughly. Shape dough into 1" balls. Roll in the sugar and cinnamon mixture. Place 2" apart on ungreased baking sheet. Bake 8 to 10 minutes. These will puff up at first and then flatten. I always line my cookie pans with parchment paper. If you can't find any you can always ask your local bakery to see if they will sell you some. They will be in large sheets but you can easily cut them in half to fit your pans. So now for my altered coffee can. This particular coffee can is from a local store here in the NW called Trader Joes. We LOVE this store. The first thing` that you need to do is simply measure your cardstock. Unfortunately, my 12x12 wasn't long enough to fit all the way around, but I just filled in later. So all I really needed to do was measure the height of my can. I decided to use my Scor-tape because I didn't want it to ever come off! I am also addicted to my Mini Misters. This specific cardstock is SU! and pretty substantial so I lightly sprayed the outside with water before I wrapped it around my can. All this does is just naturally curl my paper just a bit and makes it a little more pliable. I did a quick dry run of my main piece to see what my gap would be and then cut a matching piece approximately 1/2" wider than my gap on both sides. Then just attach to the can. Then just wrap on around. At this point, decorating is the limit. I decided to create a top and bottom border with some coordinating cardstock. I used an EK Success punch to create the scallops. This was the only border punch I could get to go through this cardstock. Then I decided to accent my can with a really cute sentiment (fluttering by with a thankful heart) from a stamp set called Charlie Daisy. My focal images were going to be butterflies from the set called Beautiful Butterflies and this sentiment would work perfectly. If I had thought ahead I would have stamped first, but I didn't (lol). BUT... this worked out just as nicely. This is why I love my clear stamps. I was able to stamp on my coffee can after the fact. Just start at one end and then rock ever so slightly to the other side as you are stamping. As I stated earlier, I wanted to use the Beautiful Butterflies set to decorate my can. I stamped most of the images in the set in several colors on a large piece of white cardstock - no rhyme or reason because I planned on cutting them out. Once they were cut, I wanted to attach them to my can, but I also wanted a decent amount of surface to be attached so I created this surface on each of the butterflies that I used. I used my scor-pal to create the creases. Just attach to project. I really like this because it allowed for the butterflies to be flattened if necessary and then lifted up later. Remember, I did indeed package this puppy up and mail it across the country. One more thing, I wanted to cover the lid and the bottom with some paper too. It just happened to work that the largest circle in the large size of circle nesties fit my lid! I used my zip dry for this purpose. Also, sorry to switch things on you, but it wasn't until after the fact that I realize my lid was green and did not go well with my chosen paper so I opted to swap out a clear lid from another can. Then I decided to wrap my cookies in some saran wrap and then I took some shrink wrap and wrapped the entire stack of cookies again. I took my heat gun and gently shrank my wrap. And finally, I made a quickie card to go along. Used an extra butterfly I had and a stamp set called Words of Gratitude as well as the Labels Four Nestability. Well that's it for today. I hope you find a good altered state to be in (lol). One more reminder that the BLOG HOP grand prize is still open and a winner will be drawn on August 31st. Details can be found HERE.